This post is the third in a series (Subtle Environmental Poisons and Disease) dealing with environmental toxic influences, particularly those with long-term ‘subtle’ action. The major subtheme here is the role of individual variation in determining the outcome of a toxic challenge, with particular emphasis on how (in some cases) an organism’s anti-toxic protective mechanism may actually be a source of problems. An implicit requirement underlying both of these topics is the existence of specialized systems for recognizing potentially dangerous non-self molecules from the environment. These themes accordingly center around xenorecognition, or the ability to recognize foreign chemical intrusion at the molecular level. Framing the matter in this manner may bring to mind the immune system, and indeed an analogy can be made between responses to chemical intrusion and innate immune systems tuned by evolution for signaling responses to the presence of dangerous pathogenic organisms. Although such parallels should not be overstated, both systems serve to maintain homeostasis for complex multi-cellular organisms. The exquisite complexity of living biosystems dictates their sensitivity to a variety of negative perturbations, which can range across a spectrum of extraneous physical, chemical and biological influences. Parasitic replicating systems are likely to have been a serious problem even at the earliest stages of molecular evolution, and defenses against them likewise must have evolved at equally early times. It is precisely the ability of invasive biosystems to replicate at a host organism’s expense which renders such parasites a serious threat. When replication per se is combined with the frequent ability of biological invaders to rapidly evolve (and alter the sets of nucleic acids and proteins by which they may be recognized), a potent selective force is generated for the evolutionary derivation of increasingly complex counter-attacks. These we refer to as immune systems. Yet there are a great many environmental potential threats which do not directly replicate, and these may originate from both biological or non-living sources. For the latter, we could think of toxic levels of metal ions or other soluble inorganic natural chemicals (such as dangerous oxygen radicals), or natural sources of dangerous gases (such as from volcanic effluxes). Across the field of biology in general, there is a huge range of natural poisons enzymatically synthesized from bacterial, fungal, plant or animal sources. As enzyme systems evolve, so too their range of natural products will change. Given these factors, the sheer numbers of potentially toxic biocompounds will vary greatly between different environments, and the specific nature of such molecules in any setting will inevitably alter over time. What is needed in order to deal with this? One might consider a system where each potential threat was countered and nullified by a specific recognition molecule, but this proposal soon looks quite impractical if a very large number of potential molecular agents are possible. Also, as just noted, any such agents are not fixed immutably – and even a small chemical alteration might stymie effective recognition by a specifically-directed receptor. Immune systems facing challenges from infectious biological replicators have used a variety of strategies, culminating with adaptive immunity where complex mechanisms are used to generate receptors which are indeed ‘tailored’ to a new and novel threat. This level of sophistication has never evolved for dealing with non-replicating chemical poisons, an issue to be revisited in a subsequent post. How then is defense against noxious chemicals obtained? While there is no comparable specificity to that seen with antibodies generated by adaptive immune systems, multiple lines of defense have evolved to counter specific poisonous threats. Dangerous levels of certain metal ions, for example, can be countered through the actions of proteins called metallothioneins, which bind and sequester such metals and thereby ameliorate their toxic effects. Strongly oxidizing chemical groups (whether generated through normal metabolic activities or acquired from the environment) are routinely mopped up by a variety of endogenous antioxidants, among which the versatile metallothioneins are included. But of particular interest in this context is the huge diversity of foreign organic small molecules which might potentially impact upon any organism’s normal biological operation – how can these be effectively neutralized? Before looking at this question, it would be useful to consider a little semantics revolving around what will become a key word here: ‘xenobiotic’. This word, literally ‘stranger to life’ is often used in two distinct, though overlapping, senses. Firstly, it can refer to any molecule which is foreign to the physiological functioning of an organism in question. In other words, in this sense a ‘xenobiotic’ denotes any molecular entity which is not synthesized by the organism itself, or which is not normally used by it as a food, nutrient cofactor, or for any other function. As such, it covers the whole gamut of natural products deriving from the collective biosphere which are foreign to the normal make-up or functioning of a specific organism. Clearly, though, this definition would also encompass all artificial molecular entities, all molecules whose origins derive entirely from human ingenuity. And here is the second sense of ‘xenobiotic’ arises, since in many cases this word is used to refer (more or less) exclusively to artificial compounds, especially where they have become environmental contaminants. Although this framing of the word is more restrictive, it would seem actually closer to its literal meaning as foreign to life in general, thus indicating something truly new under the sun. Nevertheless, for the present purposes it will be used in the first sense, which embraces natural ‘foreignness’, as well as artificial sources of molecular ‘non-self’. After all, no-one suggests that defenses against foreign chemical agents evolved to deal with the advance possibility of non-natural compounds emerging in the environment! Since it is impossible for an organism to avoid taking in physical materials from its environment, the potential for exposure to noxious chemicals will always exist. But equally obviously, the risks from ingesting nutrients are not evenly distributed across the environment as a whole, and avoiding foci of possible danger is of clear value. This is simply in accord with the old dictum, ‘prevention is better than cure’, although of course blindly applied by favorable evolutionary selective pressures. For mobile animals, chemosensory perception has an important role in screening out noxious nutrient sources. Potentially dangerous decaying foods can warn via their odors, and many food sources (especially plant-derived) bearing toxic secondary metabolites signal the potential threat through strongly bitter and aversive tastes. Since most toxic plant alkaloids are not volatile, taste aversion is likely to be the most important means of primary screening of potentially noxious environmental compounds. This then returns us to the above general question regarding how an organism can handle the multiplicity and diversity of potential molecular threats, by asking how the front-line taste-based screening can work. It is now known that the perception of bitterness is mediated by the ‘Type 2’ taste receptors (TAS2R), encoded by about 30 distinct genes in the human genome. Obviously this is massively insufficient to cover the scope of potentially noxious compounds, if each receptor was specific to a given target structure. While much more information is needed, it appears that while different TAS2R receptors respond to different bitter tastants, the receptors as a whole are not dedicated to unique structures. A key descriptive word in this context which will apply at other stages of xenorecognition is ‘promiscuity’, or relaxed discrimination between different molecular structures serving as recognition targets. Presumably, the promiscuity shown by the TAS2R receptors is sufficient for perception of a wide enough range of structures to be biologically useful as a front-line gating of potential poisons. (Each receptor is likely to have its own pattern of structural recognition, such that collectively the receptors cover a sufficiently adequate area of chemical space). Clearly, though, other lines of defense against noxious molecules will be needed. While obviously biologically useful, gating against primary ingestion of poisons could not provide any guarantees. Toxic products might fail to register bitterness, be so potent as to be still dangerous when below the threshold of taste awareness, or be masked by other tastants present in the entire ingested material. Or poisons might be inadvertently taken in by non-oral routes, thereby circumventing anything that TAS2R signaling could achieve. The conventional view of the processing of ingested drugs (meaning essentially the same as natural or artificial xenobiotics in this context) is divided into three metabolic phases, involving various Xenobiotic Metabolizing Enzymes (XMEs) and other factors. In Phase I metabolism, xenobiotics are acted on by enzymes (particularly those of the cytochrome P450 family) which incorporate or expose chemical functional groups, by redox or hydrolytic reactions. In Phase II, the initial processing facilitates the transfer of natural biological groups onto the xenobiotic to form various conjugates. Phase III reactions (those occurring post-conjugate formation) can involve further processing by Phase I enzymes, and often are taken to include the export of modified xenobiotics across cell membranes by various efflux systems. Enzymes modifying ingested xenobiotics must clearly be capable of recognizing their molecular structures, although (as seen with the TAS2Rs above) not necessarily with high specificity. In relatively recent times, it has become apparent that before the onset of the Phase I metabolic processing, the primary recognition event involves key proteins generally termed ‘xenosensors’. Many of these had been previously discovered and defined as part of a nuclear receptor superfamily, but initially termed ‘orphans’ owing to their uncharacterized ligand-binding functions. Some such proteins, however, were later found to bind xenobiotic compounds, an interaction which in turn activates these nuclear receptors as transcription factors regulating the expression of key downstream Phase I-III proteins. (This new knowledge accordingly released these nuclear receptors from their ‘orphan status’). Among these xenosensors, the pregnane X receptor (PXR) and constitutive androstane receptor (CAR) have received much attention, but various other xenosensing nuclear receptors exist. Figure A. Depiction of cellular recognition for a hydrophobic xenobiotic (able to directly traverse cell membranes). 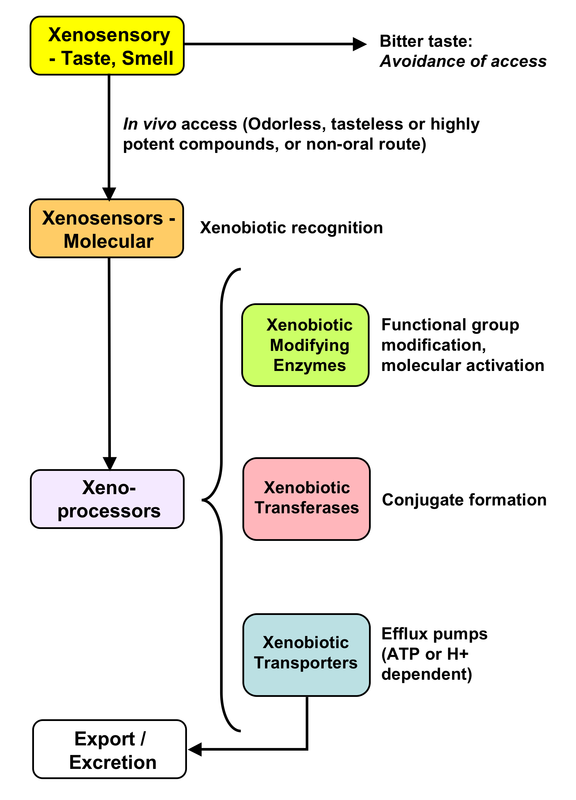 Primary xenosensing, and the three Phases of metabolic processing are depicted, culminating in the export of modified compound. This simplified depiction does not attempt to show subcellular locations of the various metabolic components. The xenotransporters can act on conjugates between modified xenobiotics and ubiquitous factors such as the peptide glutathione, but in some cases xenobiotics may be directly exported. (These alternatives represented by the xenobiotic in red). 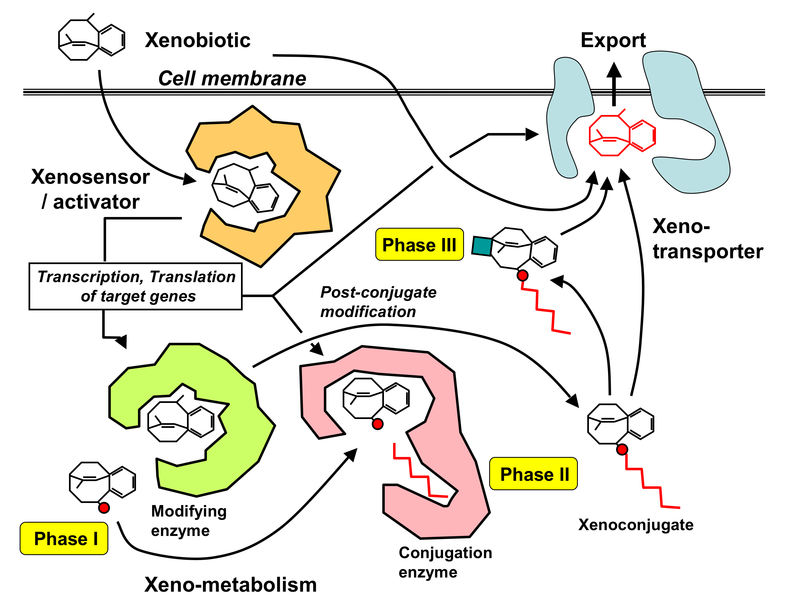 Figure B. Depiction of xenobiotic recognition for protective purposes as a process where the front-line is held by odorant and (particularly) taste receptors. The above-noted limited promiscuity of the TAS2R bitter taste receptors also applies to both xenosensors and xeno-processing enzymes. In other words, each of these participants in the recognition and processing of xenobiotics can bind a considerable range of substrates, but in that regard each has a distinct set of target substrate preferences. The manner in which xenobiotics are metabolized is crucial to the outcome of the exposure of an animal to the alien molecule(s). All of the players in xenobiotic responses and handling can vary genetically, and this can be a major influence on outcomes for both the short and long-term. In passing, we can note that genetic variation in response to chemical challenges is not limited to organic compounds. In the first post of this ‘subtle poison’ series, the deleterious effects of both heavy metals and mineral fibers was noted. In both of these cases, genetic influences on host responses have been recorded, although more data is needed to fully characterize the relevant genes involved in each area. The role of individual variation in xenobiotic-metabolizing enzymes, and in turn variation in the way such molecules are processed between different individuals, has become of great interest in recent times. For the pharmaceutical industry and medicine, clearly an ability to accurately define how a drug will behave in a specific individual would be immensely valuable, and much useful information has been gained in specific cases. In particular, studying differences in cytochrome P450 family allelic enzyme activity levels has been a profitable undertaking, with clinical applicability. But for the present purposes, let’s look at particular aspect of the innate genetically encoded anti-xenobiotic responses, where the response itself is responsible (wholly or in part) for the resulting toxic effects. Earlier in this post, the response against xenobiotics was contrasted with immune systems evolutionarily selected for countering infectious replicators. A fundamental difference between the vertebrate adaptive immune system and responses to xenobiotic threats is the restriction of the latter to sets of germline genes. In other words, while adaptive immune systems can generate and select novel receptors for countering previously unanticipated pathogens, the xenobiotic ‘immune system’ is expressed from innate sets of genomic coding sequences. In this respect, responses against ingested xenobiotics have more in common with the innate immune systems (of either vertebrates or invertebrates), where gene products recognizing specific microbial ‘danger signals’ are encoded in germline genomes. The adaptive immune system’s greatest strength, the generation of novel receptors to meet novel threats, is also a potential source of harm through the unwanted generation of self-reactive immune specificities. Even though evolution has developed extremely sophisticated ways of avoiding this, adaptive immune system autoimmunity presents an ongoing clinical burden. It might be thought that any innate defense system would bypass this problem, since any innately encoded proteins or nucleic acids recognizing self should be strongly selected against through evolution. Yet it is now known that certain aspects of innate immunity can indeed help trigger autoimmunity under specific circumstances. Responses mediated by xenobiotic sensors and processors can also directly mediate deleterious results, in contradistinction to the ‘proper’ physiological roles. Although there is no direct parallel with innate immunity to be made, certainly one can view such inadvertently self-destructive responses as ‘autoimmune’ in a broad analogous sense, if one likewise considers xenobiotic processing as a special kind of innate (and usually protective) immunity in its own right. There is more than one pathway by which innate mechanisms can produce deleterious reactions to xenobiotic challenge. There is much precedent for the toxicity of a primary xenobiotic not being manifested until modifications in vivo by Phase I metabolic enzymes are produced. As a case in point, note that a previous post in this series looked at the generation of a neurological condition recapitulating Parkinson’s disease by the compound MPTP. Here the initial molecule was not the direct villain, but rather an MPTP derivative (MPP+) produced by the action of monoamine oxidase (MAO) enzymes. (A striking confirmation of this in animal studies is the blocking by MAO inhibitors of neuronal destruction otherwise mediated through MPTP administration). Also, a previously noted environmental xenobiotic chemical found in soot and coal tar, benzo[a]pyrene is modified by Cytochrome P450 enzymes to an active epoxide derivative, which directly forms DNA adducts ultimately contributing to its carcinogenicity. In these circumstances the Phase I enzymes therefore actually aid and abet the carcinogenic process. Detoxification may require a sequence of enzymatic modifications upon an initial xenobiotic exposure. During this process, an elevated toxicity of intermediate derivatives may be ‘acceptable’ if their presence is transient and the overall chain of modifications leads to complete elimination of the initial toxic problem. Genetic variations in the activities of key enzymes which retard the removal of highly toxic intermediates could clearly result in significant problems. A classic exemplar of these processing factors is the metabolism of ethyl alcohol (ethanol). This widely popular compound is initially converted into acetaldehyde by alcohol dehydrogenase (and also the Cytochrome P450 member CYP2E1), then into acetate by aldehyde dehydrogenase, and ultimately into carbon dioxide and water. These aspects of ethanol metabolism are common to all humans, which means that anyone imbibing alcoholic beverages is exposed not only to ethanol itself, but also the same metabolic products. The most potentially dangerous of these is acetaldehyde, a known carcinogen. But since quite benign acetate results from the processing of acetaldehyde itself, the derivation of the latter from ethanol is transitory. But it may be a crucial issue just how transitory that effect should happen to be. It would seem obvious enough that a variant of aldehyde dehydrogenase (ALDH2) with reduced activity would allow the build-up of acetaldehyde after ethanol intake, and this is indeed the case for a significant fraction of humanity (mainly in East Asia) bearing an allelic variant of this enzyme (ALDH2*2) with very low activity. Blocking removal of acetaldehyde renders the effects of alcohol unpleasant, a feature which can be produced in anyone by means of drugs inhibiting the ALDH2 enzyme. (This has been the basis of one type of treatment for alcoholism). But increased levels of acetaldehyde can also result if the catalytic rate of alcohol dehydrogenase (ADH) itself is higher than the usual baseline, and this is seen with the ADH allele 1C*2. In such circumstances, the elevated rate of acetaldehyde production (relative to its enzymatic removal) increases its transient concentration in comparison to that seen with normal ADH. By whatever means increased levels of acetaldehyde may be produced, the same trend towards increased carcinogenicity results, and evidence for the role of acetaldehyde in ethanol-induced cancers is well-characterized. Under natural circumstances, alcohol may be ingested in relatively small amounts sporadically (think of fermented fruits), but high-level or prolonged exposure in humans is almost always through voluntary actions. So alcohol could be viewed as having ‘autotoxic’ effects involving both conscious-level decision-making, and also at the molecular level from an individual’s own metabolic processing enzymes. Acetaldehyde toxicity resulting from ethanol intake can also have both immediate effects (sickness, flushing) and more subtle long-term negative consequences (induction of tumors). And (to invoke the analogy with autoimmunity), some individuals are highly sensitive to the effects of acetaldehyde produced from ethanol directly as a result of their genetic backgrounds (as with the ALDH2*2 or ADH 1C*2 alleles). Pursuing this theme a little further, it’s interesting to consider (as mentioned above in passing) that acetaldehyde can also be produced from ethanol through the Phase I metabolic enzyme CYP2E1. Normally, though, the contribution of CYP2E1 is small except in the case of heavy habitual drinkers, where the enzyme becomes induced. But alcohol is certainly not the only target for this enzyme, given the promiscuous range of substrate recognition by Phase I metabolic catalysts. It eventuates that CYP2E1 converts the common analgesic drug acetaminophen (paracetamol) into toxic derivatives, and when high CYP2E1 has been induced, serious liver toxicity can result from taking normally innocuous acetaminophen doses. Here, then, is another link between a higher-level behavior (albeit pathologized by alcohol addiction) and a ‘blind’ molecular process, both of which elicit ‘autotoxic’ effects. In mice, the effects of CYP2E1 can be dramatically documented with gene knockouts. Removal of CYP2E1 activity by genetic ablation greatly reduces acetaminophen toxicity. Toxicity for another one of its substrates, benzene, is similarly removed, whereas normal mice given comparable benzene doses are severely affected. Now to consider a different pathway for self-inflicted deleterious effects from xenobiotics. Here the focus will be on the highly toxic compound 2,3,7,8-tetrachlorodibenzo-p-dioxin (TCDD), very often simply referred to as dioxin (although ‘dioxin’ per se is not chemically specific, and is also used to refer to related compounds. The combination of very high toxicity, environmental persistence, and generation as an unwanted industrial by-product render TCDD as a special problem. It came into particular prominence following the major contamination and human exposures resulting from the chemical plant accident at Seveso, Italy in 1976. Another boost to the notorious reputation of this compound came in 2004 from its use in the deliberate poisoning of the former president of the Ukraine, Victor Yuschenko, evidently an assassination attempt. (It is a little ironic that he is the second individual living within the former territory of the Soviet Union to be featured in this series of posts as a notable victim of a malicious toxic assault. The other person of note was the Russian Alexander Litvinenko, who succumbed to radioactive polonium, as noted previously). TCDD exerts its effects through binding to the above-mentioned aryl hydrocarbon receptor (ArHR), resulting in its prolonged activation and pathological expression of ArHR target genes (when the receptor is translocated to the nucleus and acts as a transcription factor). As a xenosensor (depicted in the Figure A above), the ArHR activates expression of various downstream xenobiotic-metabolizing enzymes, but TCDD is a poor target of them, being very slowly metabolized. Combined with its high fat solubility, this compound has very long persistence in humans, and its in vivo presence is thus associated with long-term over-activation of the ArHR. Animal studies provide strong evidence that binding and activation of the ArHR by TCDD is its primary, if not exclusive, mechanism of toxicity. Mice with the ArHR gene ‘knocked out’ by gene targeting technology show a stunning resistance to TCDD-mediated effects. (Although the ArHR certainly has normal physiological roles, and animals lacking this receptor show certain defects, they can grow to maturity and thereby allow such toxicological studies to be conducted). To refocus on the ‘autoimmune’ theme of this section, consider that in toxicology, it is commonly stated that ‘the ArHR receptor mediates dioxin toxicity’ (or in words close to that effect), reflecting the inescapable conclusions of the above knockout data and many other studies. Rather than a poison directly damaging the functioning of an organism, in this case the poison only creates havoc by effectively enlisting a host factor to initiate self-harm. Consider also that if the ArHR is a component of a system with an important role in detoxifying xenobiotics, then for TCDD (and other known chlorinated polycyclic compounds) the process is subverted towards a biologically dysfunctional end. As such, the TCDD / ArHR precedent would appear to be a classic exemplar of the analogy of ‘misfired’ xenobiotic responses with autoimmune reactions. Although TCDD and the ArHR are thus used to exemplify a self-damaging process analogized with autoimmunity, ironically they also provide a very cogent link with autoimmunity which is real in every sense. Evidence suggests that xenobiotics can induce autoimmunity by at least two processes, somewhat reminiscent of the above two pathways for xenobiotic-induced self-damage itself. There is now considerable experimental data supporting the contention that self-proteins which have become modified by reaction with xenobiotic compounds (‘modified self’) can trigger immune reactions which cross-react with normal self-structures, and thereby trigger an autoimmune response. This kind of effect has often been termed ‘molecular mimicry’ elicited by the xenobiotic-derived host neoantigens. Alternatively, modification of host proteins by foreign chemicals may generate self-recognition of otherwise cryptic self-epitopes. Exposure to certain heavy metals (mercury in particular) can also trigger unequivocal autoimmunity in animal models, probably by similar mechanisms. Theoretically, a second broad means of physiological modulation by xenobiotics which might lead to autoimmunity could be differential effects on specific immune cellular regulatory subsets. Real evidence towards this comes from the TCDD / ArHR system once more. It turns out that a special effector helper T cell subset (TH17) bears the ArHR receptor, and prolonged signaling induced by exposure to TCDD activates these cells and exacerbates the development of autoimmune disease in mouse models. (Knockout mice lacking the ArHR accordingly lack this TCDD-induced susceptibility to autoimmunity). So it seems indisputable that there are good grounds for proposing real intersections between xenobiotic processing, its perturbation, and autoimmune phenomena. And there we leave it for the time being. A point to consider in the next post is why some xenobiotics trigger actions which result in self-damage rather than clear detoxification. Link self-harm as a point in addition. ‘…..proteins called metallothioneins….’ These proteins (of which there are several classes) also have roles in the transport and delivery to specific subcellular sites of metal ions required for normal metabolic function. Metallothionein-mediated protection against metal ion toxicity is best characterized in the case of cadmium, but is also implicated in protection against mercury and possibly lead toxicities. For more detail see Klaassen et al. 2009; Sutherland & Stillman 2011; Gonick 2011. ‘……a variety of endogenous antioxidants…..’ These include Vitamins C and E, glutathione, and numerous others. For a review, see Rizzo et al. 2010. ‘…..the perception of bitterness is mediated by the ‘Type 2’ taste receptors….’ See Behrens & Meyerhof 2009. ‘…..different TAS2R receptors respond to different bitter tastants….’ In this respect, see an article about a database of compounds with bitter taste (Wiener et al. 2012), one of whose aims is to promote the understanding of the recognition of target molecules. ‘ Each [bitter taste] receptor is likely to have its own pattern of structural recognition….’ See Meyerhof et al. 2010. ‘….the processing of ingested drugs …..is divided into three metabolic phases…..’ For aspects of these phases, see Nakata et al. 2006. ‘….. the pregnane X receptor (PXR) and constitutive androstane receptor (CAR)….’ See a review of Tolson & Wang 2010. ‘….other xenosensing nuclear receptors exist.’ These include the peroxisome proliferator-activated receptor (PPAR), the farnesoid X receptor, and hepatocyte nuclear factors (1alpha, 3 and 4alpha). See Dixit et al. 2005; Xu et al. 2005. ‘…..the aryl hydrocabon receptor.…’ For a general background, see Abel & Haarmann-Stemmann 2010. ‘…..the deleterious effects of both heavy metals and mineral fibers was noted. In both of these cases, genetic influences on host responses have been recorded….’ For the heavy metals mercury and lead, a number of genes have been implicated (see Gundacker et al. 2010). In the case of mineral fiber-related diseases (especially mesothelioma caused by asbestos), it was noted in a previous post that cofactors were certainly involved. A genetic predisposition towards mesothelioma resulting from another mineral fiber (erionite) has been identified through family studies in Turkey (Dogan et al. 2006; Below et al. 2011). ‘…..studying differences in cytochrome P450 family allelic enzyme activity levels….’ For useful reviews, see Ingelman-Sundberg & Sim 2010; Singh et al. 2011. ‘ It might be thought that any innate defense system would bypass this problem [autoimmunity]….’ As an example of this point of view made before contrary evidence emerged, see Medzhitov & Janeway 2000. ‘….certain aspects of innate immunity can indeed help trigger autoimmunity under circumstances.’ Without going into too much detail, this can involve circumstances where specific types of innate recognition are controlled by cellular compartmentalization, and its perturbation in pathological states. A little more is provided in the adjunct ftp site (Extras; Chapter 3, Section A3) for Searching for Molecular Solutions. See also Rai & Wakeland 2011. ‘…….benzo[a]pyrene is modified by Cytochrome P450 enzymes to an active epoxide derivative…….’ See Ling et al. 2004. ‘….and finally into carbon dioxide and water….’ This occurs via the formation of acetyl-CoA and the citric acid cycle, described in any standard biochemistry text. ‘…..acetaldehyde, a known carcinogen….’ / ‘….ALDH2*2 ….. the ADH allele 1C*2.‘ / ‘….the role of acetaldehyde in ethanol-induced cancers is well-characterized.’ For more background information on these topics, see Visapää et al. 2004; Seitz & Stickel 2009. ‘……..drugs inhibiting the ALDH2 enzyme [have] been the basis of one type of treatment for alcoholism….’ The classic drug in this regard is disulfiram, although the merits of its use are still controversial. See (as an example from a large literature) Jorgensen et al. 2011. ‘…..some individuals are highly sensitive to the effects of acetaldehyde produced from ethanol directly as a result of their genetic background (the ALDH2*2 or ADH 1C*2 alleles )…..’ A very interesting recent development is the observation that the ALDH2*2 mutation results in incorrect protein folding, a defect which can be corrected by a low-molecular weight ‘chemical chaperone’. (See Perez-Miller et al, 2010) Thus, in the near future perhaps enforced non-drinkers may become capable of imbibing alcohol by co-use of drugs assisting their endogenous defective aldehyde dehydrogenase enzymes, although it’s possible that not everyone would agree that this is a good thing. ‘…..In mice, the effects of CYP2E1 can be dramatically documented with gene knockouts. ‘ For the CYP2E1 work, see Lee et al. 1996. For the benzene studies, see Valentine et al. 1996. ‘……chemical plant accident at Seveso, Italy in 1976…..’ For more on this, see an online article from Time magazine. The accident was clearly associated with many cases of a skin disorder caused by dioxin (chloracne), but the effect of dioxin exposure on cancer rates in the exposed Seveso population have been controversial. In this regard, see Boffetta et al. 2009. (TCDD is clearly carcinogenic in animal models). ‘…..the deliberate poisoning of the former president of the Ukraine, Victor Yuschenko….’ Despite bearing massive amounts of TCDD, Yuschenko survived, albeit with severe chloracne, with his symptoms slowly improving over several years. His clinical profile has been studied and reported (see Sorg et al. 2009). Unless the intention is to simply cause great pain, discomfort and disfigurement, TCDD would seem a foolish choice for malicious poisoners. Unlike rodents and other mammals, humans are not particularly susceptible to lethal effects from TCDD. Also, its overt clinical manifestation (chloracne), its in vivo persistence, and its ready detection render intoxication with TCDD easily proven. ‘ Mice with the ArHR gene ‘knocked out’ ….. show a stunning resistance to TCDD-mediated effects.’ For a review of such studies, and other xensosensor knock-outs, see Gonzalez et al. 1995. ‘…..the ArHR certainly has normal physiological roles……’ See Abel & Haarmann-Stemmann 2010 for background information on ArHR biology. ‘……self-proteins which have become modified by reaction with xenobiotic compounds …… thereby trigger an autoimmune response.’ Although protein modifications by xenobiotics have been known for over half a century, much research in the past few decades focused on DNA chemical adduct formation, given the obvious link in such cases with mutation and aberrant DNA processing or replication. More recently, it has become clear that protein damage too can have grave pathological consequences, of which autoimmunity is a significant part. The study of xenobiotic-mediated protein adducts has greatly benefited from recent advances in proteomic technology. See Liebler 2008 for a detailed exposition of these matters. ‘…..‘molecular mimicry’ ….. cryptic self-epitopes…..’ For more information with respect to the evidence suggesting this kind of autoimmune induction, see Mao et al. 2004; and Selmi et al. 2011. ‘…..Exposure to certain heavy metals (mercury in particular) can also trigger unequivocal autoimmunity….’ See a review by Schiraldi & Monestier 2009. ‘…..a special effector helper T cell subset (TH17) bears the ArHR receptor, and prolonged signaling induced by exposure to TCDD …… exacerbates the development of autoimmune disease…..’ For more on this (and other aspects of TCDD effects on immunity) see Veldhoen et al. 2008; Esser et al. 2009. Next biopolyverse offering to be posted in May, given current commitments.